Even though pharmaceutical companies spend several years and billions of dollars developing their products, there is no guarantee that a mass-produced drug will work for every patient. For patients with certain illnesses, a personalized medicine approach to treatment that includes drugs that target aspects of their specific genetic makeup can lead to more effective treatments. A personalized healthcare approach that includes targeted pharmaceuticals can help physicians and patients choose drugs that will work better for the individual patient. 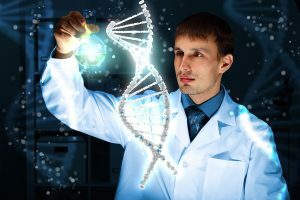 By identifying molecules (both genetic and proteomic) known as “biomarkers” in a patient’s blood, tissue or other body fluid, physicians can then tailor drug treatments to each patient’s unique genetic makeup, reducing side effects and avoiding a process of trial and error to find drugs that work for that particular patient. Researchers have discovered that because the human genome is incredibly complex, some drugs may not work for all patients. However, biomarkers can be used by physicians to develop a personalized healthcare approach that includes targeted drug treatments. By tailoring drug treatments to the individual patient, physicians may be able to avoid using drugs that can lead to sometimes-dangerous side effects or ineffective treatment for a range of illnesses including cancer, depression and heart disease. For example, nearly 10 million patients a year who are prescribed the anticoagulant drug Plavix lack an enzymatic pathway required for Plavix to effectively prevent blood clots, which means that the treatment does not work and that these patients are at an increased risk for life-threatening blood clots. According to a study published in the Annals of Internal Medicine, using genotyping to assess which anticoagulant works most effectively for an individual patient not only leads to more effective treatments, but could also lower the cost of treatment as well as well. Dhruv Kazi, M.D., assistant professor of medicine at the University of California, San Francisco and lead author of the study, compiled data on 100,000 hypothetical 65-year-old patients scheduled to receive coronary angioplasty. These patients were screened for 100 unique genetic parameters that could impact the effectiveness of several medications that prevent blood clots. When Kazi compared treatment plans that incorporated or bypassed biomarker examination, he found that treatment improved when the patient’s genotype was considered and that the cost of treatment was lowered as well.